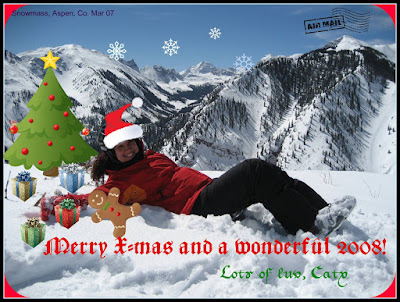 Cate's blog: Merry X-mas and a Wonderful 2008! Merry X-mas and a Wonderful 2008! Almost half a year went through and I haven't updated my blog...shame on me. I guess that as a new year resolution I'll have to ensure that that doesn't happen anymore. On Thursday 20th I'll be going to my beautiful country, Peru. I'll be going back after over a year (I have broken a record!). Where I'll be spending Christmas with my WHOLE family after 9 years (whenever I was back, Antonella was in Aspen)! And we even have an extra member this year, my brother in law: Gus :) I'm really looking forward to it. Plus, 2 Dutch friends will also be coming to Peru: Joost and Eline. And also my good German friend Martin. 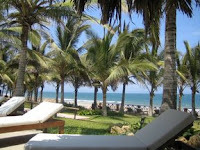 And as if this wasn't already good enough we'll be spending 5 beautiful days in Mancora, 1200kms to the north of Lima in the coast, in this beautiful beach where Antonella and Gus got married last year. There will be 33 of us...between Antonella's and my friends: this includes Peruvians living abroad, Peruvians living in Lima and foreigners (besides my friends, Murphy and Jason will be coming back to Peru directly from Aspen). I can HARDLY wait to be there! I'm going to leave it here though...and I will tell you all about it next year. 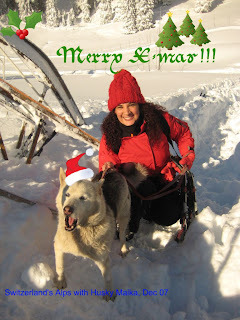 And I want to take this opportunity to wish you all a wonderful X-mas and a GREAT 2008! Thank you for your friendship during 2007. I hope that we keep it in the year to come and if geographical distance have kept us apart I hope we can meet soon.